In keeping with the MITCH theme I have going here at Mark Harvey's World here's "Monsters-Creatures" from the "Outlaws" album. This is probably my favorite track off the album. 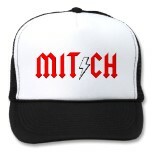 Not bad fodder for an angry MITCH tune I'd say.